You never know where your ham radio friendships will lead you. The rain splattered around me as I half ran, half walked up the steep macadam driveway toward the gingerbread-trimmed garage. Above, a huge triband beam drooped in the mist. It lurched once, then again. Apparently satisfied with its aim, the beam fell silent and still. It was 1960 and I was 11 years old. Warren Waterman, W2JRX, and Middletown, New York’s best-ever television repairman, was about to administer my Novice exam. I had memorized the ARRL License Manual and taught myself Morse code by listening to W1AW cipher groups on my National NC-60 receiver. That old five tube general coverage superhet was about one step up in sensitivity and selectivity from the crystal set I’d built using a copper penny and safety pin for the detector. But today I was too young to know fear and too unimaginative to imagine failure. Of course I would be successful. That was 50 years ago. Little did I know how ham radio would enrich my life by introducing me to new experiences and wonderful friends. 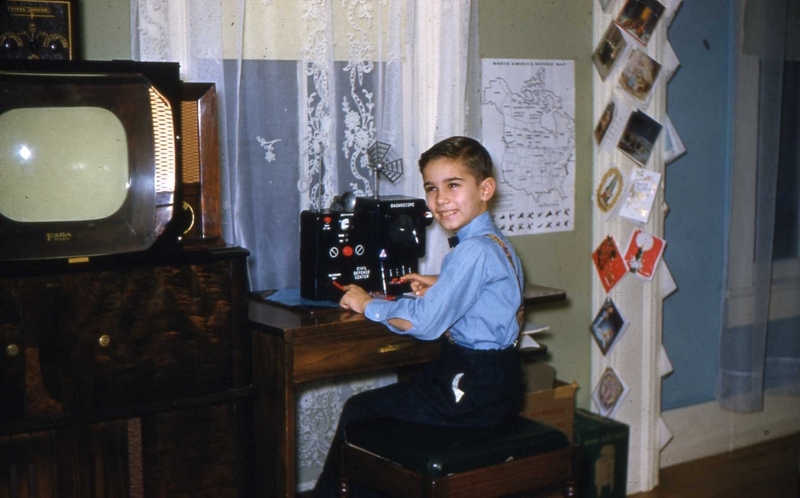 Perhaps the most valuable contribution ham radio made to my life was to teach me, at a very early age, that I could achieve anything if I were willing to work at it. It seemed to take forever until “The Envelope” arrived and I was reborn as WN2LQF. Our family was not exactly well-off and I was lucky to have even that NC-60 with its bandspread control. Those spiffy Hallicrafters receivers in Boy’s Life magazine weren’t within my reach. We lived in a housing project where my dad was the maintenance man. Outside antennas were strictly prohibited but dad was able to sneak up into our long building’s attic space and hang the 40 meter dipole that I had fabricated from magnet wire. He brought the feed line down through my bedroom closet ceiling and that closet became my first shack. If I wanted a transmitter, I was going to have to build it. Since my personal net worth alternated between slim and none, the innards of discarded TVs and junked radios would have to be recycled. I found a well-thumbed edition of (I think) CQ with a circuit called “The 22 Watt Monster.” It used a 50L6 output tube with a 50Y6 rectifier. There was no isolation transformer. One side of the ac line went directly to ground; the other went to 120 V ac. I guess the 22 W referred to dc plate input because it only dimly lit a 60 W light bulb. But it put WN2LQF on the air. The logs from that era are long gone but I do remember my first contact was with another Novice in Hubbard, Ohio on 7175 kilocycles. It was the only crystal I owned. Every so often I’d take it apart and rub pencil lead on one side of it to pull the frequency a little. That way my logbook’s “Band/Frequency” column wouldn’t look so boring. I had an absolute ball until an ARRL Official Observer’s card arrived in the mail notifying me of clicks and chirps at about the same time my Novice license was due to expire. In those days, it was necessary to appear in person at the Federal Building at 641 Washington Street in New York City for the General class exam. With no means to get there, I went back to Warren Waterman’s garage and took the Technician exam, became WB2LQF and set out to explore the VHF world. Somehow, mom and dad found $44.95 in the household budget and a Heathkit “Twoer” appeared under our Christmas tree. Dad filled a 5 gallon bucket with sand, stuck a length of old aluminum TV mast in it and I mounted my 2 meter “rotatable” homemade beam antenna up near my second floor bedroom’s ceiling. For QSL purposes, I would report using a “10 element Yagi at 20 feet.” I reasoned that two floors, each with 8 foot ceilings came to 16 feet. Then I added a couple more feet for the floor joists and rounded up. I logged contacts from Mt Greylock, Massachusetts to Atlantic Highlands, New Jersey. In many ways, my life’s journey may have begun on 145.8 megacycles (now I owned two crystals). It was here that I met “Grif” Griffin, W2LOR. Grif had been a Navy radioman in World War II. He would frequently invite me to his house and I’d always be sent home with tales of the South Pacific, useful operating hints and an armload of precious “junk.” Grif was an unabashed CW junkie and introduced me to the semiautomatic “bug” and the joys of higher speed CW. Not to be upstaged by the Navy, John Gottlieb, WB2OJK, invited me to his shack just as frequently. John was in the Army National Guard. John was also a private pilot restoring a 1940s era Ercoupe in his garage. He was the most meticulous man I’d ever met. Even as John worked on his airplane project he’d tidy up and leave his shop spotless after each session. John explained that a neat, clean and well-organized environment always made him feel more motivated to do a quality job. John was also very creative. I would look at a broken item and see a broken item. John would look at the same broken item and see a resurrection. “Junk re-thunk” comes to mind. John treated everything and everyone with great respect. I wanted to be like John. It was John who encouraged me to join Army MARS and thus I became AL2LQF on the MARS frequencies. MARS represented the first time in my young life that I had ever contributed my time to any sort of organization. Enter Pete Smith, WA6DUI, an Airman stationed at Stewart Air Force Base in Newburgh, New York. Pete worked with computers in the Air Force. Stewart was a Strategic Air Command base back in 1964 and also the site of one of 23 SAGE computers in operation throughout the United States between 1963 and 1983. SAGE stood for “Semi-Automated Ground Environment.” It was designed as an early warning network to locate Soviet bombers that might carry atomic bombs. The SAGE computer would then be able to direct Nike and BOMARC missiles toward the bombers. The computer itself was located in a concrete blockhouse. Pete arranged a tour of the blockhouse for us local hams. The SAGE computer used a lot of tubes in those days — 60 thousand. Designed and built by IBM, it also used 175,000 diodes and 13,000 transistors, and weighed about 250 tons. Pete began to unravel the mysteries of the computer for us. I was being introduced to people, concepts, ideas, technology…possibilities that broadened my world. These fellow hams were my best friends throughout my teen years. They treated me with respect, they had confidence in me; they included me in local ham activities. They were never farther away than the time it took the “Twoer” to warm up. I didn’t see them as adults or authority figures. They were…hams; they were my friends and I got to call them by their first names. The teenage years can be troublesome times for youths. In the turbulent ’60s we certainly had our challenges. That I avoided smoking, drugs, alcohol and other undesirable activities was at least partially the result of not wanting to disappoint my mentors. I spent almost as much time homebrewing as I did operating. MARS provided periodic “goodie boxes” chock full of surplus components. Grif could be counted on to supply any missing parts I needed. Back in those days, you were nobody unless you had a 6146, 807, 811 or 813 for the final. Grif just “happened” to have a few of each lying around and gave me a choice. I picked the 807 because the shape appealed to me and it felt real good in my hand. It gave off a nice warm glow, too. As high school graduation approached, and with no money for college, I needed to make some decisions about my future. Grif, John and Pete would all play important roles. Grif’s tales of Navy life and his impressive technical skill, which he credited to Navy training, influenced me to enlist in 1966. 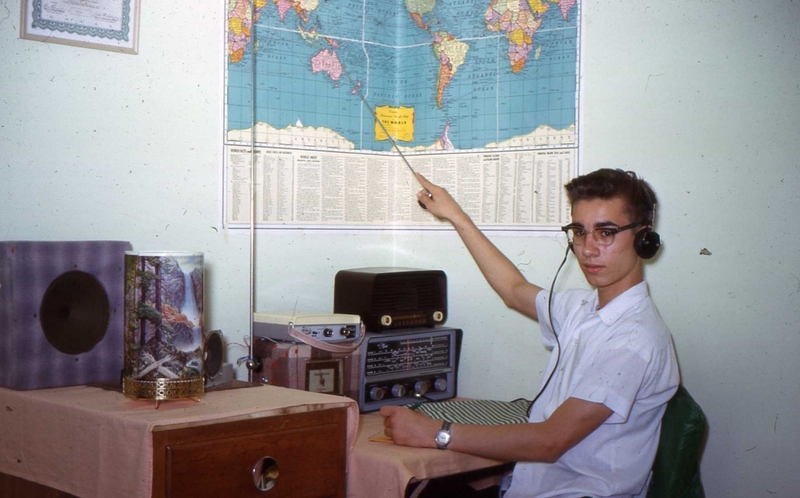 Because I held an Amateur Radio General class license, I was guaranteed enlistment as a Radioman Third Class and electronics training in San Diego. The Navy made good on its education promises and after completing several months of training, I reported to my first duty station — Marine Amphibious Squadron Four aboard the USS Boxer. My duty hours were spent in Radio Central on CW, phone and RTTY; my off-duty hours were happily spent helping to run phone patches as K9YGR/Maritime Mobile. We made a lot of sailors very happy in those days before cell phones and e-mail. Of course, all that wonderful Collins and Drake equipment made me very happy, too. 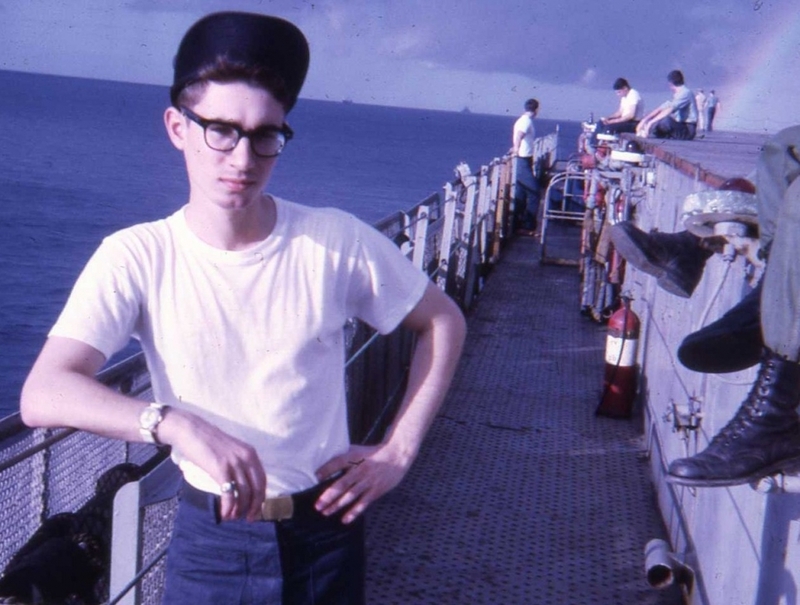 My tour of duty in the Navy strengthened my sense of values and responsibility, exposed me to new situations and provided me with some valuable post high school formal training. Thanks, Grif! With my active duty obligation now complete, I needed to start a career, not just find a job. 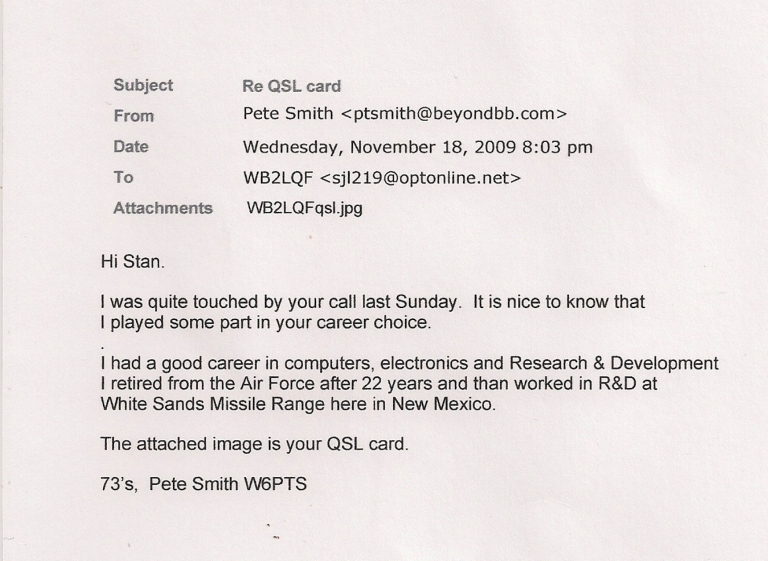 Pete and that giant IBM-designed SAGE computer at Stewart Air Force Base had made a lasting impression on me. I knew it was unlikely that I could ever become a computer programmer without a college degree but I secretly hoped for a “backdoor” through which I could get into the computer field at some level. Now seemed like the right time to apply a good measure of Grif’s advice to get my foot in that door first and worry about proving myself later. It was late August of 1969. Neil Armstrong had walked on the moon a month earlier. Two weeks ago, I was at Max Yasgur’s farm, along with 400,000 other people, just up Highway 17 from my home. Anything was possible, right? So I applied to IBM. Not only did they hire me, they trained me to operate and, later, to program the IBM System 360 line of computers. On my first day at work, Mr Bensky, my new boss, sat behind his desk and peered down at my newly hatched IBM employee personnel file. “Wow” he said. “It says here you’re a ham operator, huh? You should pick this stuff up with no problem at all! Welcome, aboard!” Thanks, Pete! Welcome aboard, indeed. As an IBMer I now had a start on a great career, a regular salary and a measure of stability. Marriage and a family followed in the 1970s and life settled into a pleasant routine. Periodically, I would fondly recall those long-ago summer days spent in John’s garage as he worked on his Ercoupe airplane restoration. I began taking flying lessons in 1973. That was 36 years ago. In those 36 years I’ve soared peacefully in sailplanes, spun and rolled wildly in aerobatic machines and taken my family on many wonderful flying trips in tamer aircraft. But nothing was quite as stirring as August 12, 2006, the day I taxied onto the runway, straightened the tailwheel, pushed the throttle forward and began the take-off roll for the first test flight in the experimental airplane I had spent several years building all by myself. I can assure you that the wire runs and the electronics installation were absolutely neat and there was a single common ground point. Remember, first and foremost I’m a ham. Thanks, John! I must confess. I have not always been a “good” ham. There have been times when Amateur Radio has taken a back seat to other responsibilities. There were the years I spent earning undergraduate and graduate degrees while being a dad to two daughters, sharing household duties with my schoolteacher wife and managing large software projects at IBM — all concurrently. I may have abandoned ham radio at times, but ham radio never abandoned me. I’ve always “come home” to ham radio. It was always there, waiting for me. Its message to me has been consistent: you can do anything you want, as long as you are willing to work at it. I am grateful for having known Grif, John and Pete and thankful for their influences upon my life. I believe that ham radio has the potential to teach transferable skills beyond those that are strictly technical. I am grateful for having learned, through ham radio, such skills as self-directed learning, persistence, attention to detail, self-discipline, pride in workmanship, getting along with others and, most importantly, self-confidence. I believe that my own early introduction to these skills, at an impressionable age, aided and guided me throughout my life. I’ve never been afraid to try new things. I learned very early in life that knowledge is powerful, liberating and available to anyone who wants to develop it. I’ve learned first-hand how important mentor relationships can be; they have the potential to be gifts that continue to bear fruit throughout a lifetime. I’ve heard that “things are different now” and young people have too many alternative activities that vie for their time and attention. Perhaps it is so. I refuse to assume that ham radio is not competitive. I don’t believe that the only potential outcome from an interest in ham radio is, or should be, an electronics or science career. Rather, I prefer to think in broader terms of benefits that can enrich the lives of anyone, at any age and from any walk of life. Warren, Grif and John are Silent Keys now. I lost track of Pete. WA6DUI came up as a canceled call sign. Since I now knew that I could do anything if I were willing to work hard enough, I found Pete’s old QSL card from December 20, 1964 and began an Internet search. I found him in Alamogordo, New Mexico, still active and now operating with his Advanced ticket as W6PTS. We had a grand chat by telephone and exchanged e-mail addresses. I had the opportunity to personally thank Pete for including me in that field trip to the SAGE blockhouse 45 years ago, which launched my interest in computers. 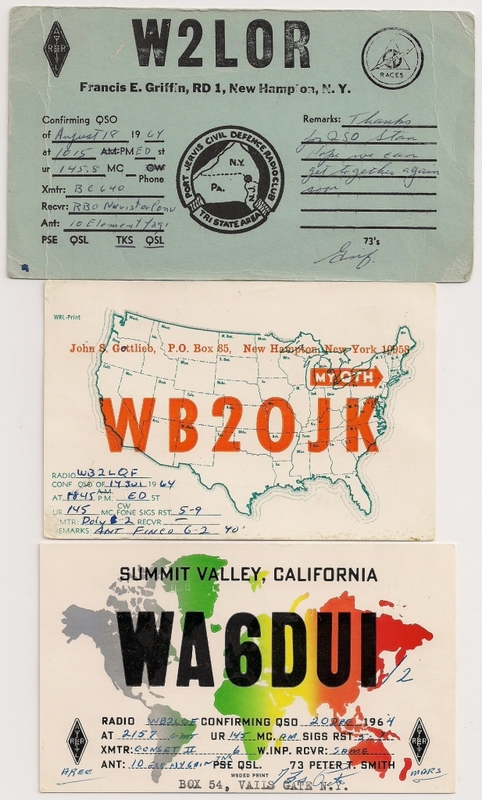 We also exchanged electronic images of the QSL cards we received from each other in 1964. I can’t help but wonder how my life’s direction might have changed if just one of these guys had been factored out of the equation. I’m retired now, from both IBM and from 20 years of college teaching. I’ve come full circle. The kids are grown. My wife and I recently downsized to a townhouse. Once again, I’ve “come home” to ham radio. I plan to stay for good this time. Outside antennas are strictly prohibited in our townhouse community. Oh well...been there, done that. I’ve got a 40 meter dipole up in the attic again and, yes, the feed line comes down through a closet ceiling. My current rig is a modest little Ten Tec 1340 low power kit I proudly built. An MFJ antenna tuner, a Ten Tec “Budget” keyer and a neat little brass ScQRPion paddle, #691, round out my station. Every so often I hook up my old Vibroplex Champion bug — the very key Grif encouraged me to buy and the one I took to sea with me. I get out good enough. All photos courtesy Stan Levandowski, WB2LQF. Stan Levandowski, WB2LQF, an ARRL member, has been licensed since 1960. First licensed as WN2LQF, he now holds an Amateur Extra class license. He holds an undergraduate degree in business and earned his MBA from Long Island University. Stan retired from IBM where he was a software development manager and from Nyack College where he taught organizational management classes for 20 years. He is a member of the QSY Society and the Mount Beacon Amateur Radio Club. 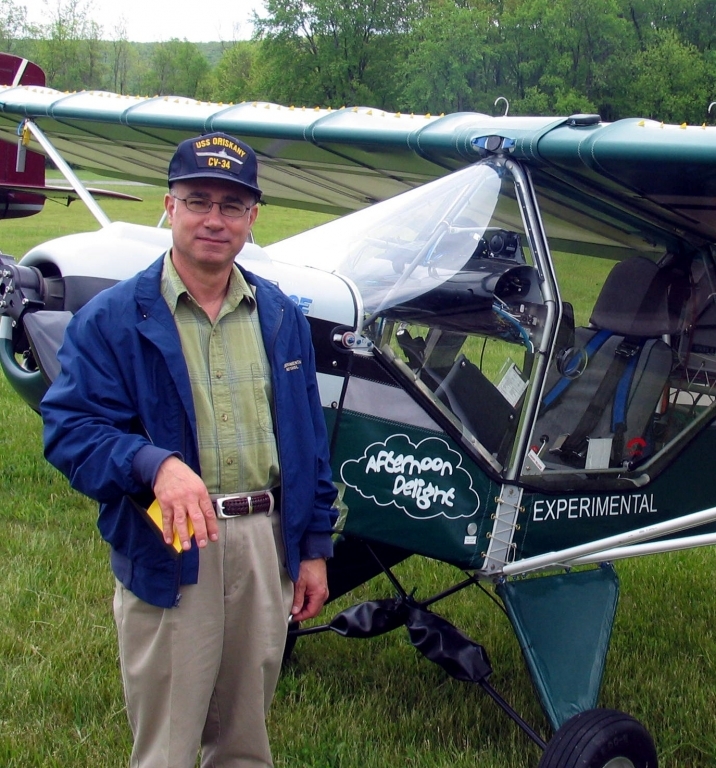 He is also a licensed private pilot and a member of the Experimental Aircraft Association. Stan enjoys low power HF CW operating and is presently trying to master a new sideswiper. You can contact Stan at 6 Chatham Ct, Fishkill, NY 12524.